Stepped pale-pink walls, brass lights and velvety benches are among the decorative art-deco-style details at this wine bar, which Brooklyn-based Workstead created inside an old brothel in Tulsa, Oklahoma. Vintage occupies a building with a colourful history in the city's Blue Dome District – an area downtown named after an art-deco-style domed building completed in 1924 – that was formerly used as a brothel. The wine bar is located on the first floor, below The First Ward hair salon, which was also designed by Workstead. Plush furnishings, and brassy and wooden details in the bar are a tribute to the 1920s and 1930s architecture in the surrounding area. Pink-painted walls step inwards towards the ceiling – a profile typical of the art-deco aesthetic. The front of the walnut bar, built in the centre of the room, is staggered in a similar way. Workstead – led by husband and wife Robert Highsmith and Stefanie Brechbuehler – enlisted local millworker Eric Fransen to complete the bar. He also built a glazed floor-to-ceiling volume encased in a brassy grid for storing wine on the rear wall, and a similar but smaller structure mounted behind the bar. Furnishings were sourced from a mix of American contemporary and antique dealers, including Los Angeles-based brand Lawson Fenning, which specialises in "modern-vintage furniture". Workstead similarly aimed to capture an "elegant mix of old and new" in the moody Atlanta restaurant it designed for lifestyle magazine Garden & Gun. At Vintage, dark green bar stools with golden legs provide seats for more casual drinkers, while those who want to stay longer can relax on curved benches built into wooden booths facing the bar. The seats are covered in a velvety grey-green textile, which is also used for panels slotted between mirrors on the wall behind. Facing the benches are tables topped with squares or circles of black stone, and large chairs covered in a soft grey textile. Additional seating is provided by window nooks at the front of the space, which are painted dark blue. There is also an outdoor courtyard at the rear, past the kitchen and the bathroom. 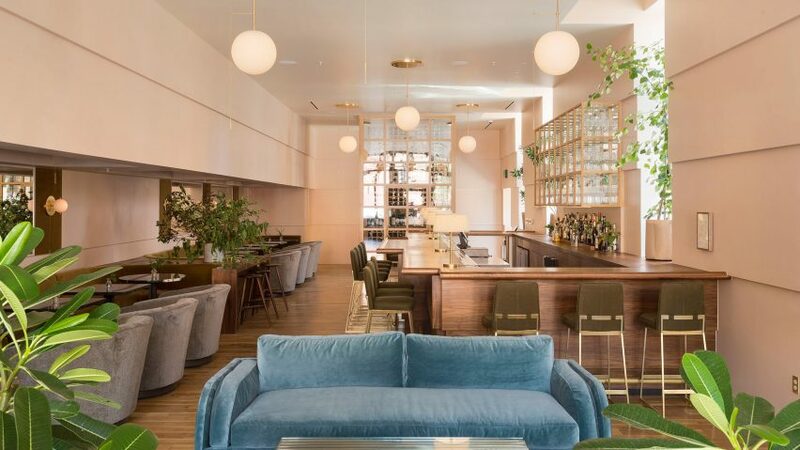 All the brass lighting in the space is Workstead's own, including the drooping Signal Pendants, spherical ceiling lights known as Globes, and matching sconces. Vintage used to be located south of downtown Tulsa, but was moved to this new space this year. Proprietor Matt Sanders teamed up with Mark Perkins, Jessica Bond and James Sherrod – who own the building and the hair salon – for the project. As part of the refresh, Workstead was also enlisted to redesign the bar's branding, overhauling both the logo and website – a first for the studio. The bar's name is now written in golden, italicised text in the window, while black tiles form a "V" in the white flooring at the entrance. Workstead has completed several renovation projects that reference the style of the buildings they occupy, including a handful in Charleston, South Carolina, where the husband-and-wife team ran a second studio until recently. The duo transformed a home in the city for themselves, where they reimagined "heritage elements as modern luxury", and preserved plaster- and paint-splattered brick walls during the overhaul of another residence nearby.